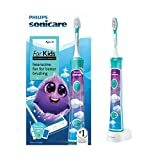 The Philips Sonicare for kids is the number one most recommended best electric toothbrush for kids. It is fitted with a kid pacer that helps your children brush every section of their mouth and a kid’s timer which encourages them to brush for the dentist recommended two minutes. The kid pacer is coupled with a kid two minutes timer that buzzes and switches the brush off when you have brushed for the dentist recommended two minutes for an all-around thorough cleaning. The Philips Sonicare for kids is specially designed with two friendly brushing power modes for children aged 4-7 years. The twin pack comes with two accompanying brush heads (a pack of 2). It features a free interactive smart app that can be connected to bluetooth to track your children’s brushing habits. It is important to teach your children good brushing habits at a tender age because they will endure throughout their lives. This app is ideal because the data stored can be used to measure progress and make any needed adjustments. The app offers exciting rewards for good progress made. It is fun; it teaches how to brush effectively on their own and will appeal to of all ages including teenagers. It has a customizable brush handle to keep things fresh and fun. It comes with eight panels that appeal to both girls and boys that you can use to change the look and feel of the brush to fit the child’s style. It employs patented Sonicare brushing technology that makes 500 strokes per second to effectively remove plaque. It is 75% more efficient in removing plaque in between teeth and under the gum line than manual ones. It has an ergonomic rubber handle that is convenient for children to handle. It has a multi-grip handle that allows both the adult and the child to hold the brush. This is crucial in the initial stages when you teach your child how to brush their teeth. 91% of experts in dental care say they actually prefer the HX6321/02 Sonicare as the toothbrush of choice for their own children compared to any other. It has received rave reviews in major shopping portals and forums. 98% of people who have bought it say that their children enjoy brushing their teeth and they brush longer. You get access to the patented sonic technology that is scientifically proven to remove 75% more plaque than a manual brush. The Philips Sonicare for Connected HX6321/02 makes 500 strokes per second and sweeps fluids in between teeth and hard to reach areas to effectively remove plaque and clean under the gums. Although this brush can and has been used by children below 3 years, Philips Sonicare for Kids is ideally designed for 4+ year olds. If under 3 years olds are to use this brush, they should do so with the help of an adult so that they don’t brush too hard. Brushing too hard can damage their soft gum tissues.